Elgin Christmas Tree Farm, located at 120 Nature's Way in Elgin. Lots of fall fun with paid admission including a hayride, mazes, rubber duck races, playground and picnic areas, and pumpkin photo opportunities. Admission is $6 per person ages 2 and up except for Pumpkin Festival Weekend (see below). There is also a kiddie train ride, mini pumpkin decorating, large pumpkins, and more available for an additional fee. October 5th through October 31st - October Fun hours are Mondays through Thursdays from 10:00 am to 2:00 pm; Fridays and Saturdays from 10:00 am to 5:30 pm; and Sundays from 12:00 noon to 5:30 pm. October 12th/13th and October 19th/20th – Pumpkin Festival Weekends hours are the same as those listed above. Admission is slightly higher - $6 for ages 2 to 12 and $8 for ages 13 and up – but in addition to the features listed above there will also be live bluegrass music, face painting, and free kiddie train rides. There will also be food, kid crafts, and pony rides available for an extra fee. October 14th – Open House hours and fees are the same as for regular October Fun days, but there are no scheduled tours and you can take things at your own pace. Evergreen Farms, located at 242 Monkey Road in Elgin. Open every weekend in October, Saturdays 10:00 am to 5:00 pm and Sundays 1:00 pm to 5:00 pm. Admission is free and includes wagon rides around the farm, toddler play area, pumpkin decorating (after purchase of a pumpkin), petting zoo, and more. Activities available for $2.50 per ticket include the pumpkin hunt, pumpkin launcher, pumpkin train ride, face painting, and much more. Rides on an authentic pumper fire truck are available for $5.00 per person. Barton Hill Farms, located at 1115 FM 969 in Bastrop. Open weekends September 28th through November 11th, Saturdays from 10:00 am to 10:00 pm and Sundays from 10:00 am to 5:00 pm. Admission is $7 for ages 3 to 10 and $10 for ages 11 and up (you can save $1 per ticket by purchasing online). Children two and under are free but must be accompanied by a paying adult, and an all-access pass can be purchased for an additional $5 (see below for more details). Free with admission are the Willie Nelson-themed corn maze, visits with the farm animals, pumpkin painting, and play time on a replica early Texas maritime schooner (The Lively) and an 1800s era Texas fort (Fort Wilbarger). Activities available for an additional fee include face painting ($5 to $7), barrel train (included with $5 all-access pass), and the jumping pillow (also included in the $5 all-access pass). There is also a pumpkin patch with pumpkins of all sizes available for sale, plus food, drinks (beer, wine, and soft drinks) for purchase. Check their Facebook page for updates on live music events at the Farm. October 19th/20th – FREE admission to visitors bringing in a non-venomous reptile in celebration of National Reptile Awareness Day (one free human admission for each reptile visitor). October 26th – FREE admission to those in dinosaur costume, and $1 discount for those dressed in any other costume. Kids can also earn treats by counting the hidden Halloween items throughout the dinosaur nature trails. October 12th – Cedar Creek United Methodist Church Fall Festival, located at Highway 21 at FM 535 in Cedar Creek. Festival is from 10:00 am to 4:00 pm and admission is free. Fun for the whole family including games, quilt raffles, BBQ and bake sale, auction, child ID program, a “Thomas the Train” ride and much more. 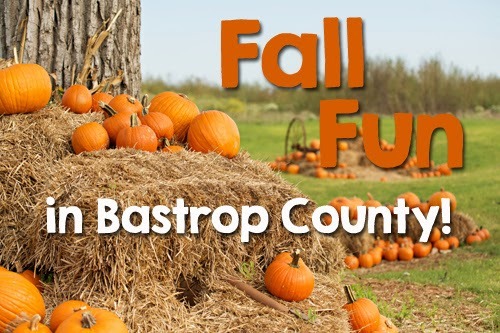 October 20th – Calvary Episcopal School 9th Annual Fall Festival to be held at the Toro Plata Ranch, Highway 304 in Bastrop. Hours are 12:30 to 3:30 and events are kicked off with a BBQ meal and dessert (donation only for the meal). Activities include a petting zoo, pony rides, bouncy house, trackless train ride, rock climbing wall, bungee trampoline, face painting, and more. Participation in activities at this fundraiser is by wristband only – they are $20 for the first child and $10 for each additional child. October 21st-25th – Scarecrow Building Competition at Rocky Hill Ranch, located at 578 Highway 153 in Smithville. Come out to the Ranch and give scarecrow building your best shot! All materials will be provided for a cost of $10; scarecrow building hours are from 10:00 am to 7:00 pm. Scarecrows will be displayed at various locations in Smithville on October 26 and the public will be able to vote for their favorites. Winners will be announced at the Smithville Scarecrow Festival on October 27, also to be held at Rocky Hill Ranch (see separate entry on this post). For more information please call 512-988-0988. October 26th – Little Sheep Learning Center Fall Festival Fundraiser, located at 202 Highway 71 West in Bastrop. The festival will take place from 10:00 am to 2:00 pm. The $5.00 general admission includes games inside a fenced area. There will also be a BBQ plate (brisket & sausage) available for $5.00 and $3.00 horseback rides. October 26th – 26th Annual Hogeye Festival, Elgin (various locations). Hours are 10:00 am until 6:00 pm. This popular festival features live music on three stages, handmade arts and crafts, children’s activities, car show, BBQ pork cook-off, “In a Pig’s Eye” dart contest, the crowning of King Hog or Queen Sowpreme, a children’s costume pet parade, a carnival, “Hogalicious” dessert contest, cow patty bingo, the “Pearls Before Swine” art show and great food! Free festival shuttle available at the Highway 95 North Park and Ride. For more details please refer to the Schedule of Events. October 27th – Smithville Scarecrow Festival at Rocky Hill Ranch, located at 578 Highway 153 in Smithville. The culmination of the week-long Scarecrow Building Competition (see separate entry on this post), this event features a haunted house, children’s obstacle course, pumpkin painting, games, prizes, food, and drink. The winner of the Scarecrow Competition will also be announced. For more information please call 512-988-0988. October 27th – St. Peter's Lutheran Church Fall Festival, located at 401 East 8th Street in Elgin. Hours are from 4:00 pm to 8:00 pm. There will be vendor booths, hamburgers and French fries, a live auction, and a raffle that includes a calf, a TV, a rifle, and a meat package. There will also be games available for youth of all ages. October 30th – Rosanky Baptist Church Hallelujah Festival, located at 2160 FM 535 in Rosanky. This festival is from 6:30 pm to 8:00 pm. Dress in Biblical character costumes is encouraged and there will be lots of fun activities and candy for the kids. Admission is free. Fridays and Saturdays, October 11th through October 26th – OZ: Enchantment of the Sovereign (A Halloween Spectacle) at the Playhouse Smithville, located at 110 Main Street in Smithville. Based on the book "Land of Oz" by L. Frank Baum, this play follows the adventures of the Scarecrow, Tin Man, and Tip as they enlist Glinda the Good to help return Emerald City to its rightful owner. Tickets are $10 per person and all shows start at 7:30 pm. Fridays and Saturdays, October 11th through October 26th (plus Sunday matinees October 13 and 20) – Oz! at the Bastrop Opera House, located at 711 Spring Street Bastrop, TX 78602. A dazzling musical based on the L. Frank Baum classic story "The Wizard of Oz." Friday and Saturday shows begin at 7:30 pm, and Sunday matinees start at 2:30 p.m. Tickets are $12 for adults; $10 for seniors (age 60 and above), students, veterans, and active military; and $5 for children age 14 and under. VIP tickets are available online in advance for $15 (adults) and $8 (children age 14 and under). October 16th/17th – Halloween Movie Nights at the Elgin Public Library, located at 404 North Main Street in Elgin. October 16th is Scary Movie Night for ages 13 and up; movies featured are "Dream House" and "Mama" (both rated PG-13). October 17th is Family Movie Night with a showing of "Return to Halloweentown," rated PG. October 18th - "The Bad Boys of Bastrop County" Book Launch Party & Haunted History Bus Tour to be held at the Bastrop Public Library, located at 1100 Church Street in Bastrop. Author Lisa Lach will be launching her latest book at a free launch party beginning at 6:30 pm; copies of the book will be available for $20. Bad Boy re-enactors (and their Ladies) will be on hand, so come dressed in your best cowboy gear for some fun photo opportunities. At 7:30 pm, the buses roll on a tour of famous shootout, hanging, lynching, and feud locations, including Main Street, the County Courthouse, the Historic Jail, and the Bastrop Cemetery. The $10 bus tickets are available at the Bastrop Public Library, the Bastrop Chamber of Commerce, and online at Haunted History Bus Tour Tickets. October 26th – Smithville’s Halloween Bash to be held at the Smithville Recreation Center, located at 106 Royston Street in Smithville. This all ages event runs from 4:00 pm to 8:00 pm and includes a free costume contest at 6:00 pm, games, prizes, candy, moon walk and haunted house (moon walk and haunted house require tickets). Wristbands are available for $7 per person, and tickets are 6 for $1. For more information call the Recreation Center at 512-237-3282, extension 7. October 31st – HalloweenFest, downtown Bastrop from 5:00 pm to 9:00 pm. One of Bastrop’s biggest events features trick-or-treating down Main Street, raffles, haunted houses, games, live music, and scary movie classics screening at the Bastrop Opera House. Admission to HalloweenFest is free of charge. Note: watch this space for updates on some changes to the organization of this year’s Fest, including new street closures. October 31st – Safe Trick or Treat Trail, Veterans Memorial Park and Historic Downtown in Elgin. Free treats and activities for kids of all ages; the event runs from 6:00 pm to 8:00 pm.